Honestly, it’s a little strange Nicolas Cage hasn’t already made a movie based on an H.P. Lovecraft story, no? So it feels appropriate and a bit overdue to learn he’ll finally be starring in a Lovecraft adaptation. But what makes this story especially odd is the director the production has landed to helm the movie. 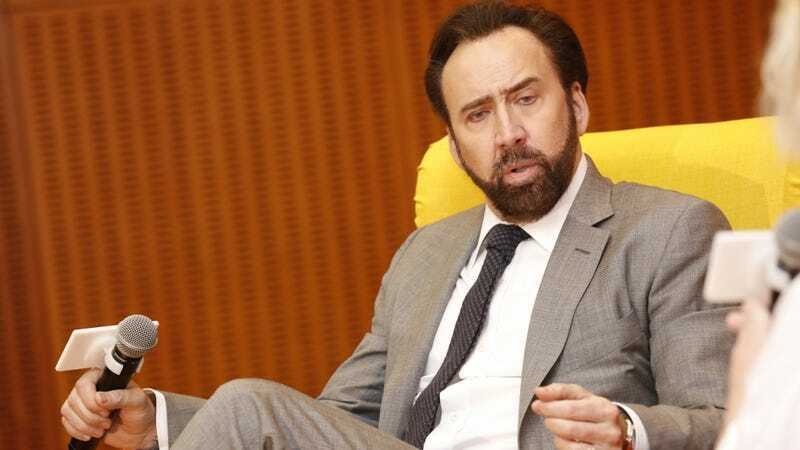 A new press release is announcing Nicolas Cage will be re-teaming with his Mandy producers to create a film adaptation of Lovecraft’s short story “The Color Out Of Space.” (Or “Colour,” rather, if you’re a Lovecraft pedant.) And while that’s already exciting news, the extra-intriguing aspect of the film is the listed director: Richard Stanley. For those of you who have yet to see the stranger-than-fiction documentary Lost Soul: The Doomed Journey Of Richard Stanley’s The Island Of Dr. Moreau, back in the early ’90s Stanley was a sought-after indie horror auteur who had just landed his big studio breakthrough, which also happened to be his childhood dream gig: Helming an adaptation of The Island Of Dr. Moreau. He then watched in horror as he was fired from the project, and the production spiraled into chaos, resulting in a very silly movie. Since then, the South African director has retreated into the wilderness, reappearing only sporadically to shoot a documentary or oddball short film. So his first feature film in more than 20 years will certainly be something to behold. Will he once more hire a witch doctor to help ensure his success? Will Marlon Brando again show up and make a mess of everything? Will The Color Out Of Space be a deeply weird movie? Only one of those questions has a likely “yes” as the answer, and sadly, it won’t be the reanimated corpse of Brando making things weird. The adaptation of Lovecraft’s story will follow a family who moves to rural New England in order to escape the hectic pace of modern life. After a meteorite crashes into their front yard, however, melting into the ground and infecting both the land and space-time with a strange color, the family members “discover that this alien force is gradually mutating every life form that it touches...including them.” The film doesn’t have a release date yet. Nicolas Cage, by contrast, has once more been released into our hopes and dreams.